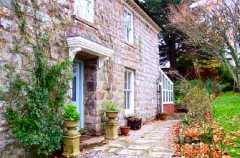 A warm welcome awaits you at Calize Country House, set in its own grounds above the village of Gwithian. Built in the 1870’s for Lord Hocking, it has fabulous views across to Godrevy Lighthouse and St Ives Bay. Recently refurbished, Calize provides four ensuite bedrooms reflecting the character of the building and optimising the wonderful position. There is also a two bedroom self contained apartment. The accommodation is non smoking, offers full and varied breakfasts and is ideally situated for house guests to enjoy this picturesque corner of Cornwall. Found in the heart of a 100 acre working farm, the charming late Georgian farmhouse is a real hidden treasure that sits surrounded by a small traditional cottage garden. The owners have been doing Bed and Breakfast since the 1970s. In this time they have built up a high standard of accommodation and service, now much of its custom comes from people who have stayed before. They offer everyone a pleasant and comfortable time - Everyone feels like they are part of the family. The Star Inn is a 17th century Grade 2 listed public house in the centre of St Erth offering real ales chilled lagers good wines & home cooked bar meals. br / br / We have a games area with pool table and dart board as well as a south facing beer garden for those long summer days and wood burning stoves for those cold winter ones. br / br / St Erth is on the National Cycle Route 3 which runs from Lands End to Gwithian so we welcome cyclist s and walkers with or without dogs. br / br / We have 2 Bed & Breakfast rooms of which dogs are welcome in the ground floor en-suite Gardinia room. The Hayloft is a spacious en-suite double room which is accessed by steep historic stone steps that may be unsuitable for some guests. Finest quality accommodation and service. The 3 available bedrooms are all en-suite. They have radios, televisions and coffee and tea making facilities. The house is surrounded by attractive gardens where an area has been reserved for guests to enjoy the plants and trees. A heated, indoor swimming pool is available to guests during the summer months.